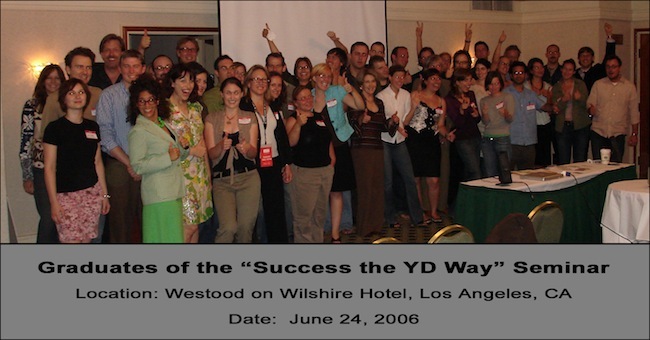 A dedicated squad of seminar participants attended the YD Industries Success Seminar at the Wilshire on Westwood Hotel’s Salon B, Los Angeles, California, United States of America. Led by YD Industries moderators Steve Musselman and Dean Kramer, the motivated group studied detalied power point slides, actively listened to lectures, were educated by a guest astronaut motivational speaker, saw some magical tricks, and ultimately did challenging personal work during extensive break-out sessions. YD Industries congratulates the participants for their hard work and trusts they will be able to apply to principles of, “IDACSU” to their own, increasingly successful, lives and careers. The graduates of the YD Success Seminar in Los Angeles. Seminar attendees wishing to check back with YD Industries, submit follow-up information, or inquire about fellow alumni should contact Steve Musselman. Please type Steve Musselman in the body of the message for proper routing. Personal testimonials of successful “IDACSU” implementation are welcomed!